Personalised Horoscope chart reading is your birth certificate in astrological terms!! Learn more about Natal Chart report. 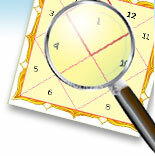 There are many astrologers and service providers casting horoscope chart. It is important that your horoscope chart is done by an expert. Natal chart: In many cases wrong horoscope chart will lead to complicated decisions, especially in finding your matching partner. Ours is a human prepared horoscope charting service. Note: The best accuracy in the interpretation of the natal chart/ birth chart is achieved with the correct entry of Date of birth, time of birth and place of birth. All the fields marked by * are compulsory data that are needed for preparing your natal chart and report. For gender, females check the radio button as the male button has been set as default. Use the calendar image on the right side of the date of birth field to choose your date of birth. For time of birth use the 24 hour clock format presented. If you are not very particular about your exact time of birth, then you are advised to select Noon as it would give you an average timing for the planetary positions for the day. Please note that an exact time of birth only can give you the accurate Ascendant. Enter your place, city and country of birth accurately. We would be calculating the time zone, latitude and longitude for your place of birth. Any deviations might change the natal chart positions and readings. Here you need to enter your birth details, like place, date and time of birth. The report would have your natal chart drawn along with the exact planetary placements and their house positions. There would be a basic interpretation of the various planets and their positions in the natal chart. Get your personalized horoscope for the day. See how the planets' positions today affect your personal natal chart. These horoscopes are written based on your date of birth, not just your Sun sign / zodiac sign. The regular birth chart is not very accurate it happens to remain same for more than 2 hours of Birth Time. Hence Navamsha ascendant plays and important factor. Enter the birth particulars of yourself and that of your partner/ potential lover. The report would have the birth charts of both the individuals and a comparative analysis of the planetary positions and how it would affect your relationship. This report would give a detailed analysis of the synastry between both the charts and a common interpretation as well. This would give you the planets and their positions for the whole month. Also their aspects with each other and transits are given with exact date and timing for three different time zones.